Please add what web browser you are using to any problems you report. Last edited by Sixth Vanguard; 06-10-2011 at 08:28 PM. With Internet Explorer 8 the forum listing page doesn't break the date of the last post properly. Don't know if this is an "issue" or not, but I guess I'll post it here. One of my favorite features of this old board was the link under your user avatar that let you jump directly to all new posts since your last visit. To me, this was a great time saver, and spared the effort of crawling throught all the forums just to what was new. The lack of this feature on other boards made me a much less freqent visitor once I discoverd it's existence here. Is it a feature that could be implemented? Yes.., in the 8th tab (New Posts) in the tool bar (at the top of each screen) is where you will see the new posts since your last visit. 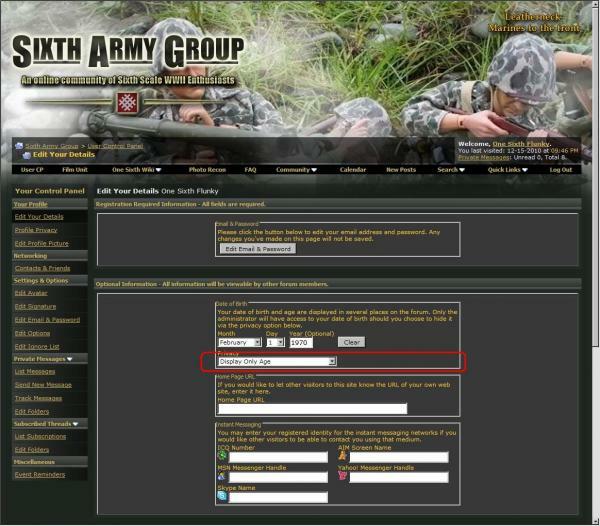 This and additional help can be found in the FAQ (5th tab) of the tool bar. All pictures in the old gallery will stay there. That keeps any link to them from breaking and we get the dreaded lost photos. If anyone wnats to they can always create new galleries here and upload the same pics. No harm, no foul. Right now there is no limit to user picture uploads. We will see how that goes. Once you uplaod your sig pic, you click "Insert Signature Picture" which you did, but then you need to make it a link. then click the "insert link" button and enter the link you want it to go to. I just tried to post 7 pictures in the near miss and it looked like they all went in but only 2 showed up? Not sure what's going on there. Can you try editing the post and adding them again? Love the new board guys - I'm excited about having an avatar/signature here finally! That being said - I tried to post an updated sale list here today and I couldn't because of the 10,000 character limit. For the time being I'll break up the list into a thread post and a reply in that thread - but could the character limit be raised? If anyone wants to they can always create new galleries here and upload the same pics. No harm, no foul. Thanks for the info Reece much appreciated... It really looks great here, awesome job!!! Reese. had to us enter after each picture posted. The old board we did not see the pictures only the url were it came from and then enter to drop the picture down. The pictures are posted now. Just a learning curve. Just maybe me but my IE8 did not like the board . it likes chrome tho. 1. Can't get the "thumb's up" and "rollyeyes" and some of the other emoticons to show up in a post. I can see them when I am typing a post, but not after I submit it. Any ideas? 2. Is the age going to show up again, or is there a box I need to check in my profile? It's kind of nice for context when entering a discussion with someone you don't "know". 3. Maybe I'm being stupid (wouldn't be the first time...) but, I can't figure out how to make a member folder under "Photo Recon". Any tips? EDIT: I clicked the "Images" number under my Avatar and it takes me to "Leatherneck's Images" under photo recon, but there is nothing there. It says that I have used 81 kb of space, but there is no picture. When I try to upload a picture, the picture which I tried to upload yesterday is not visible in the directory on my computer, but all of the other images in the directory are visible (and the image is still there if I go to it through Windows Explorer). Last edited by Leatherneck; 12-17-2010 at 07:24 PM. Think I got the user category problem fixed. Speak up if anyone still has trouble. Like the new layout , and the ever-changing title pic is nice...much more of a showcase than the previous rather tired old pic. So very smart all round , and congratulations to all concerned for all the hard work. I still have eye problems with the white-on-black , which slightly affects my eyesight. The white on grey is tolerable if not ideal , but I can't really see the point of everything else being black , when there are so many other more restful colours. I freely admit I have a migraine tendency which makes the problem worse for me than most people. The worst ever colour combination is red on green , which is unreadable ! - Photo Recon user category problem fixed, thanks! - followed your advice on the age display issue, saved my changes, but still don't see it appear. Hey Guys.........love the new format...........but I think the clock is wrong. It is now 0915 EST and some of the post are reading the time as having been posted at 1:15 PM today. Should that be 0115 AM? You have to change your time zone in the User CP located in the tool bar under the rotating banner at the top of the page. Once in your user CP, click "edit options" under settings and options on the left side of the screen. Scroll down until you see Date and Time Options close to the bottom of the page. Hope this helps. I have had a couple small issues sometime when I try to post the screen goes blank and I get an error message saying my request didn't go thru but when I go back to the thread my post is there. I got the same message when trying to send a PM and I know a friend had the same problem he called me to tell me he couldn't PM me but it actually did go thru. The only other thing I noticed was all my old sent messages I deleted ages ago were back all 250+ LOL No big deal i deleted them again but it was interesting to see some of them. I was on the old board since day 1 it will take me a little time to get used to the new one but so far it seems to be working well. Also I put the plans in the wrong section should of been in the other one. Really digging the new uniform the Sag is sporting. Not sure if this belongs in this thread, but I'm really not a big-fan of the highlighted text. Some threads I've skipped over someone's comments because they are one line and I think it's a signature or a quote. Otherwise, looking great, and just getting the feet wet. I received a PM from a guest this morning. I did not reply immediately, nor did I delete it. When I went back to find it, it is not in my messages, and is nowhere to be found. I have to say I agree with Original Paintbrush, the text being highlighted with grey boxes is kind of distracting to me, makes the page too busy. How come all my posts show a link to a jpg at the bottom rather than the actual jpg? Who ever fixed my signature to link to my website I say Thank You Very Much..... I appreciate it greatly. I went back 14 years--I just update my info in the CP area. This, posted the day the new board went up. The Smilies don't get selected correctly. I pick a certain one and another random one shows up. What gives? I've gotten a couple of your messages, and have replied. Not sure they are reaching you inbox though. If you want to continue our deal in email, mine is sawemoff2009@yahoo.com. I am having similar problems with the PM I do believe though. How do you know they aren't sent? If they aren't saved in your sent messages folder, that may be because saving sent messages is off by default. You can turn it on, it is an option in th user control panel settings. You can also ask for a "read receipt" when you send a PM, which will tell you when a PM is read. It has to be opened by the person it is sent to to be marked as "read". Hammer and sawmeoff, try sending me a PM with the read receipt option selected. It is at the bottom of the PM window in "additional options" before you send it. Let's see if these do. Cool that is three of them. I tried to upload three pics. First one went fine, although i have no idea which user category it went to. Tried several times but the next two would not appear. I did hit "submit" after each one. ... I tried to post an updated sale list here today and I couldn't because of the 10,000 character limit. and I had to break it up into THREE seperate posts to get it all posted. This happened to me again with a regular post in the Ground Pounders Section - though in that instance I was able to edit down the wording. Please let me know if the character limit could be raised for posts. 20,000 characters would do it I think. OK, I'll try a quick answer after looking at your sales post. I was able to take all three posts and post them in one post. The trouble with the original posts is all the formatting used. I am not sure if you are copying and pasting from some other program or creating the posts in the board editor, but all the BOLD and LARGE FONT and WHITE FONT used for so much of the text uses up a ton of characters. Every new line adds 2 more characters, so all the seemingly blank lines added to space things out add about 300 characters alone. Like I say, not sure how you create your list in the first place (my suspicion is copy and paster from MSWord) but it takes a lot of space with all the format tags used. All together the three posts add up to 18,910 characters. - The board text is white without having to specify it. Removing all the added "color=white" tags takes about 5,000 characters off the combined post, so now it is down to 13,469. - There are a bunch of blank lines that are BOLDED and UNDERLINED, those ad 14 character each when they are never seen. Removing those saves a couple hundred characters. - General clean up of extra formatting gets it under 10,000. Maybe 10,000 characters is low. It is actually twice the default value used when you setup the board software. Obviously the limit is intended to keep people from bogging down the system with walls of text. I think the limit helps people think about what it is they are posting. If people are hitting 10,000 characters I have to think they are stopping and wondering "wow"
Certainly something to think about. I don't think it is going to change any time soon without some serious thought. Thanks for the tips Reese - I was indeed copying and pasting from a Microsoft Word document. I'll edit it better next time. Just something to get used to on the new board I guess - the old board you could copy and paste anything into the text box and it wouldn't do anything to it. My biggest concern was for my sale posts - I don't want to edit anything out of those and risk losing a potential sale. My other post in question was a thread I started to highlight a Volksgrenadier kitbash I put together - so it was easy to cut some of that down. I get what you are saying Fred. If you want to you can make this board behave like the other. This board has an "enhanced" editor that is used by default. You can set it to a simple text box, or like the old board the "standard" editor. Maybe if you use the standard editor it will copy and paste like the old board. If you try it let us know how it works. Interesting Reese... Humm, I'll have a look at that and see what I can come up with. Has anyone had problems with replying to others in Private Messages? I have been trying to reply to some one and they are not replying . Just wondering. Is there a refresh mode, some I can check prior to logging off to see if anything new came up while I am logged on? I click "New Posts" on the navigation bar, right next to "Search" and if anything is new it shows there. I posted a reply to the German Generators thread with a link to Schiffer books, I see that according to the main page I was the last to post but the post is not at the end of the thread. I still can't seem to get the smiles to work either I see some people have them in their posts but for some reason they do not pop up all the time when i use them. Thanks, I thought it was strange because the other post I did went thru fine. I figured maybe it was because of the link to Schiffer that caused it to not post. Do you know why the other smiles don't work? Before you never saw the actual smile you only saw the characters in the prepost. I am still trying to get used to the new forum. The site for me is working pretty well, but today when I was reworking my signature I noticed that the file size limit is too small for my optimized .png. The signature is being hosted on my servers so no SAG bandwidth is being used. Is there a way to increase the signature file size limit? Also when I try to use the [img] [/img] tags it converts my gif to a .png. Is there away to work around this in my profile? Are gif file extentions not permitted on this site anymore? Last edited by armourguy; 03-07-2011 at 04:04 AM. Let me see what's up with the signature pic. OK, got it working. I was able to upload your picture as your signature picture, it didn't complain about the file size. The file size set is generous and you file is very small. Not sure why you would get the warning. Once uploaded I used the bbcode [sigpic][/sigpic] to insert it into your signature. gifs are handled specially on the board. Few people use gifs for anything other than animation. The board switched to png for the ability to use high quality transparent images in the board style. Looks like it works, let me know if there are anymore problems. Thanks, I appreciate the assistance. Anyone having problems with sent PM's? The only messages I can view are just inbox. I'm in the middle of a deal and wanted to make sure my PM's were going out...but can't find any. Check reply 40 in this thread and see if it answers the problem. Can't delete some older messages. Clicked them and said delete still there. "messages" as in "Private Messages"? Last edited by Reef12; 05-04-2011 at 12:59 AM. I have not visited the SAG in a while and I was impressed with the upgrade! I like how I was able to add a Avatar and how smooth the board works.